Spa menus have a lot in common with restaurant menus. They list every single spa treatment you can have. They make every service sound amazing. And sometimes what you get isn't what you were expecting. Just like it helps to understand cooking techniques, ingredients, flavor combinations and classic dishes when you're ordering in a restaurant, learning about classic spa treatments, ingredients, and equipment will help you have a better spa experience. Spa menus are organized by the type of service: massage, facials, body treatments, along with nail care, waxing and salon services. Larger overnight spas might have a few additional categories, like energy treatments, Asian therapies, or signature therapies. Massage is the most popular spa service, and you'll find deep tissue massage, Swedish massage and aromatherapy massage on every menu. Most spas offer a "customized massage" (though in truth, all massage should be customized.) You choose the length of time, usually 50 to 60 minutes or a longer 80- to 90-minute massage, though sometimes the spa offers a half-hour mini-massage is available. Other massages that are commonly found include hot stone massage; sports massage; a targeted head, neck and shoulders massage. Some spas offer therapies like craniosacral work, Thai Massage, Shiatsu or reflexology. They might list them in another category like energy work or Eastern therapies. Ask about the training of the person who is giving the service. A couple of weekends does not make someone a master. Facials are the second most popular spa treatments. They can be confusing because there are so many to choose from. Do you book the anti-aging facial, a European facial or the deep-cleansing facial? Don't fret too much. Facials have the same basics steps — cleanse, exfoliate, extract, massage and mask. The main difference is the skin care products used in each facial, and most spas carry at least two lines. One might be more active, like Hydropeptide, while another is more natural, like the yummy-smelling Eminence line from Hungary. For guidance, talk to staff at the front desk for help. If you're actually in the spa, check out the different lines in the gift shop to see which one most appeals to you in terms of ingredients, philosophy and feel. Also, the esthetician can take a look at your skin and recommend the right facial on the spot, even if you booked one with a different name. Facial extras might include a peel, an ampule of special serum, a lip treatment, more time for scalp and foot massage, or special equipment like Hydrafacials or LED treatments. Body treatments are a great under-rated spa service, especially if the spa has special equipment like a Vichy table. It usually consists of a body scrub — a great add-on before a massage — or some sort of followed by body mask that helps detoxify your body or hydrates your skin. The body scrub exfoliates your outermost, dead skin cells with a salt scrub (rougher), a sugar scrub (gentler) or some other exfoliant, like coffee grounds or fruit enzymes that gently loosen the inter-cellular bonds. Body brushing gives you a mild exfoliation and stimulates your lymphatic system, but it won't leave you as silky smooth as a salt scrub. Body scrubs, body brushing and wraps often show up in longer treatments called rituals or signature treatments. When reading the menu, be sure to notice the scents — lavender, vanilla, honey, orange — and consider whether the scent is natural or synthetic. Lavender is usually from an essential oil, while vanilla is most likely a synthetic fragrance. If you're trying to stay natural, body lotions have more synthetics and preservatives than a body oil. Finally, some spas make their own scrubs, but most use a pre-made scrub from a big tub because it's so much easier. How will the body scrub come off? The best scenario is that you continue to lie on a table while a vichy shower is swung into space over you. It's just heaven. Sometimes the therapist removes the scrub with warm steamed towels — also great. At some spas you have to get up to take a shower — kind of a drag. While you're showering the therapist changes the sheets and you lie back down, usually for an "application" of oil or lotion. This means don't expect a massage unless you've booked extra time for that, or it's part of a signature treatment. A body scrub and application of lotion can be a stand-alone treatment. But once your skin is exfoliated, it is ready to absorb something good for you. The therapist might apply shea butter or some kind of rich lotion, then wrap you in a sheet or blanket for a hydrating wrap. If the therapist uses clay, mud or seaweed, it's a detoxifying treatment. Once the product is on you are usually wrapped in a piece of aluminum foil and blankets, or layered with hot towels, a sheet and blankets. This also might need to come off in a shower. The therapist should stay with you during the wrap and give you a head or foot massage, but this doesn't always happen. Ask about that before you make the appointment. You may also want to get body treatments from massage therapists, rather than estheticians. Resort spas want to provide unusual experiences, so they might have more energy work or specialties like Ayurveda or Chinese medicine. Look for watsu, which requires a special small pool heated to body temperature. They might also have beautiful outdoor venues, especially if they are in a temperate climate like Hawaii or the Caribbean. Make sure the outdoor treatment room is somewhere quiet. It won't be relaxing to get a massage on the beach if you can hear lots of people. Most spas also put together some kind of longer service as a ritual or signature treatment. 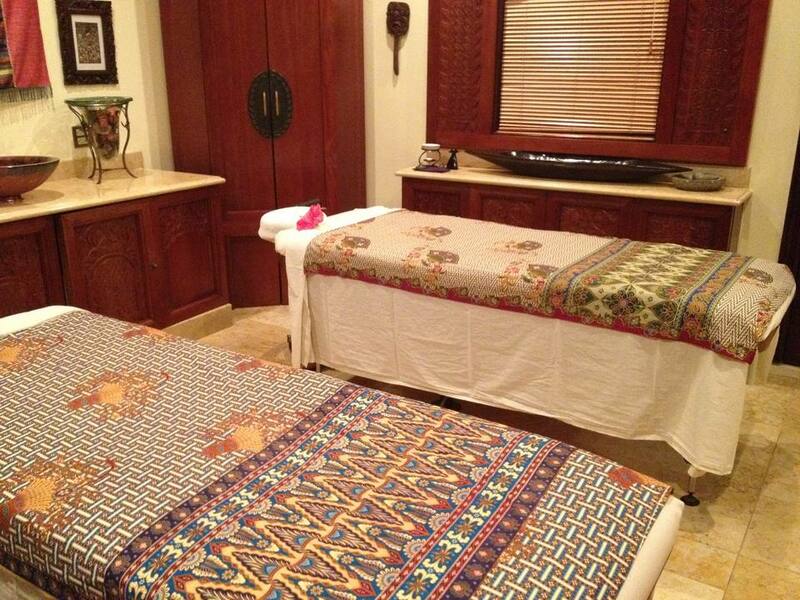 It might consists of a foot bath or hydrotherapy bath, aromatherapy, a body scrub and wrap, and full-body massage. Hydrotherapy is fine, but sometimes it seems like you're paying for what you could do for free in your room. Estheticians are going to give a better facial than a massage therapist (even one who also has an esthetics license, so you may want to ask for more body work instead of facial massage.